Back in February (remember that? ), Nicole and I (remember her?) decided to pay a visit to Devon and Dorset, which are counties in the South West of England, should you not be familiar with British geography. I'm sure the lack of Hordes O' Tourists made up for the cold and the bitter wind. In any case, we stayed close to, and thus spent a fair amount of time in and around, Lyme Regis (which is just about in Dorset), home of the endlessly charming Dinosaurland Fossil Museum. It not only boasts stacks of fossils collected locally, but also a collection of late '80s model dinos fit to slap a smile on the face of any plastic saurian aficionado. And a Dinosauroid. More on that later. It seems like an awful long time since the first half (it isn't really, I just moved home in the meantime), but here's Part 2 of my look at this Bentontastic book from 1993. As promised, I'll open with a more detailed look at the piece used on the cover, namely Vladimir Krb's fantastic Albertosaurus panorama produced for the Royal Tyrrell Museum of Palaeontology. Back again after another unfortunately long gap, I bring you a selection of links that caught my fancy. I don't have enough time to read every wonderful post and article out there, so remember to check out our blogroll in the sidebar - and always feel free to send suggestions for blogs that haven't been added yet! Anyhow, it's time for the 83rd Mesozoic Miscellany! At RMDRC Paleo Lab, Anthony Maltese writes about two new species of Rhinconichthys, the "muppet fish." At the PLOS Paleo blog, Sarah Gibson writes about a new paper about a Dilophosaurus specimen that gives Mr. Bill a run for his money. You may have heard of the MOOC called Dino 101 at the University of Alberta - and may have even enrolled in it. Victoria Arbour writes about a recent study on learner engagement among its students. Jungle Plush, makers of plush dinosaurs that are lovable, huggable, and reflect modern palaeontological knowledge, successfully launched their shop last year on Kickstarter. 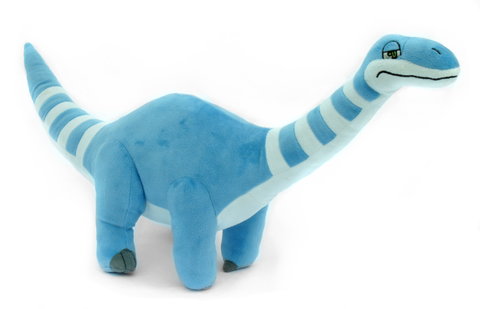 They recently released an Apatosaurus plush, which I like even more than their initial Rexy. I mean... check out those front feet! Rare is the sauropod plush that gets that right. Head to JunglePlush.com to see their wares. Apatosaurus, a new plush toy from Jungle Plush. Photo © Jungle Plush. Connect with Jungle Plush at Twitter, Facebook, and Instagram. Zach Miller offers a terrific primer on the obscure Triassic saurophagids, with nifty artwork by Ethan Kocak of Black Mudpuppy fame. 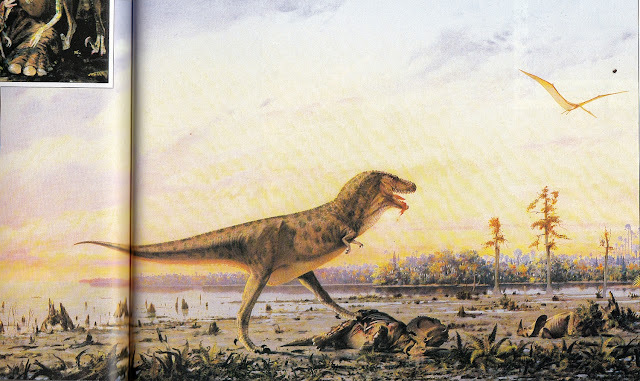 Learn about another obscurity, Betasuchus, from The Tetanurae Guy. Sometimes, Mesozoic theropods got ouchies on their feet. Lisa Buckley writes about pathologies in trace fossils. The Horniman Museum is hosting an exhibition on dinosaur nests, eggs, and babies, and Dave Hone writes about it at Archosaur Musings. If you're a fan of paleobotany, you'll want to see Jason Brougham's work-in-progress on the Jehol ecosystem. Speaking of paleobotany, a recent episode of the In Defense of Plants podcast discussed cycads, and their fossil record and prominence in paleoart was discussed. I know it can feel exhausting to hear about another Patreon, another Kickstarter, another paleontological cause that needs more support. But the fact is, many of these have very low pledge levels available. 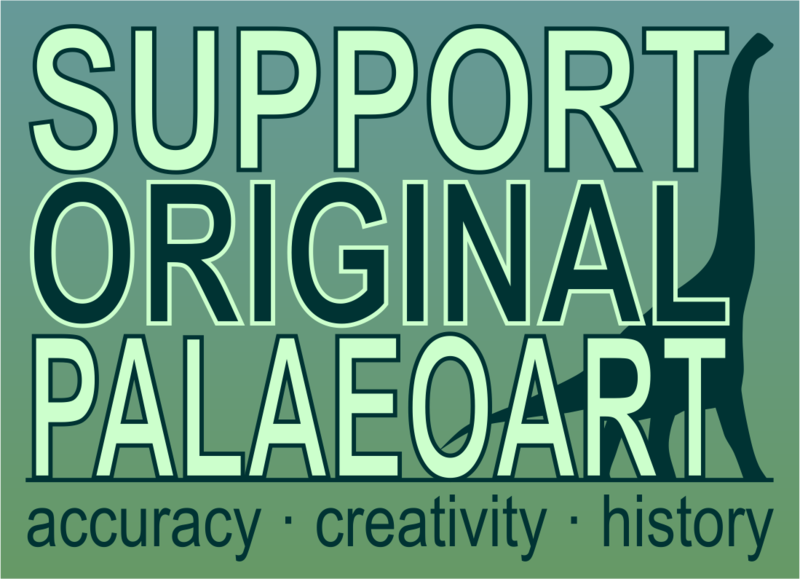 If thousands of enthusiasts of prehistoric life and art ganged up to pitch in an amount we might otherwise spend on a drink or empty calories, we could make a real difference in the lives of researchers and creators. I feel like I do fairly well with my own work - I can count on at least a small check from Redbubble every month. But when I add up what I've actually brought in with my prehistoric art and design, it falls far short of being a meaningful income source. Many others are in the same boat. So I'm going to make an effort to use this space to share more of these efforts. So, I'd like you to consider pitching in to help fund the Virtual Natural History Museum, a project helmed by Dave Marshall, Laura Soul, and Claire Morley. They are answering a rousing call from educators who beg for more classroom resources relating to Earth's history. The Virtual Natural History Museum is meant to be a public resource that gathers scattered on-line palaeontological resources that are rarely advertised or promoted. Using a game-based interface, it is planned to be an engaging, user-friendly way to bring the world's palaeontological treasures to students. A worthy cause, I'm sure you'll all agree. Help make it happen. Follow the vNHM at Twitter, Facebook, and on the Palaeocast website. The #sciart tweetstorm organized by the SciAm Symbiartic team just wrapped up its second go-round, and again, it was almost too much fun. One of the artists I connected with was Victor Leshyk, who shared a great variety of art and design. I loved his details of a NHMU-commissioned piece which depicts different hypotheses for the Cleveland-Lloyd Quarry. This image, featuring the mud trap hypothesis, captures the raw drama of the Morrison fauna with two of its superstar inhabitants. Enjoy! And check out Victor's site, too. 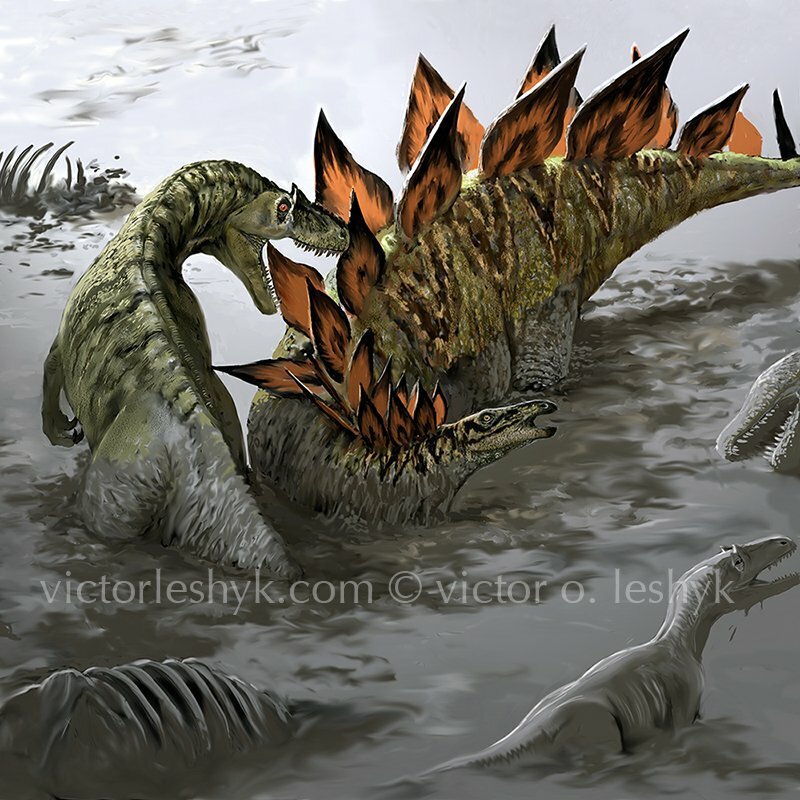 Allosaurus and Stegosaurus get dirty. Illustration by Victor Leshyk, used here with his permission. I enjoy wearing my love of prehistory on my sleeve (I'm wearing my Raven Amos Ichthyovenator as I type and my Rebecca Groom Microraptor just arrived in the post). For one, it's fun just to have some amazing paleoart on my shirt. But it's also because it may invite a conversation from a fellow paleo-enthusiast or just a curious outsider. Recently while I brainstormed ideas for new design sets for my shop, it struck me that it would be cool to just come out and tell people that it's fun to talk about natural history. 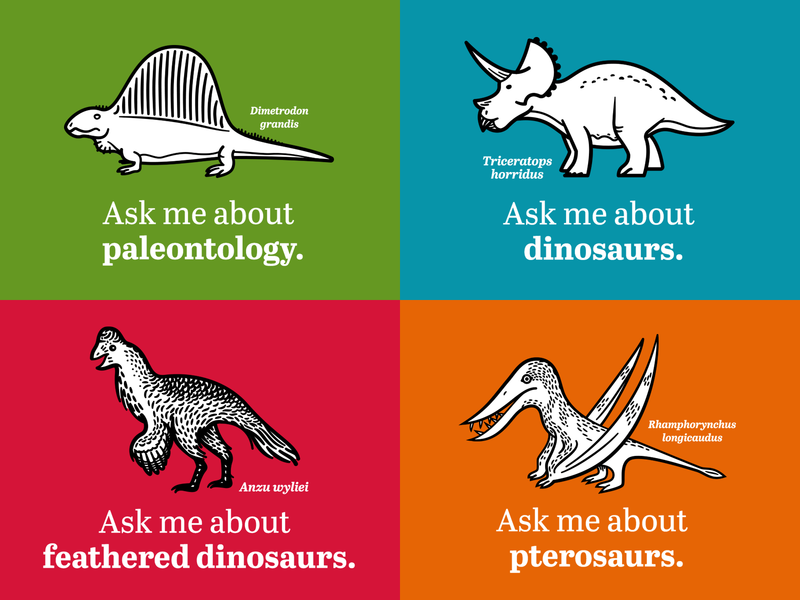 So the "Ask me about..." series was born, featuring simple, (hopefully) charismatic illustrations of prehistoric critters. These initial four designs are now available in my shop, on various colors and styles of tees and hoodies and other merchandise. A "bird evolution" version is in the works, and from there I think I'll move out to explore other facets of natural history.